What a nice Thanksgiving this year! I was quite calm in my kitchen. I spent from 8am to 9pm in my favorite spot. Starting from breakfast at the beginning of the day to Thanksgiving food festivities to clean up, all went smoothly. This year I bought a Heritage turkey at Ski’s Meat Market. Along with the turkey we had stuffing, mashed potatoes (Eric brought), sweet potato casserole (Paige brought), baked onion casserole, lasagna, Russian potato salad, ham, rustic dinner rolls, cranberry orange Bundt cake and apple crisp. Melt 3/4 cup butter in large skillet, add onions and celery. Saute until soft, 8-10 minutes. While celery and onions are sauteing put together the stuffing. In a large bowl add the toasted bread cubes with herbs, sausage, salt and pepper. Add butter, onions and celery to large bowl along with 1 1/4 cups broth. Toss gently. Whisk 1/14 cups of broth and 2 eggs in a small bowl. Add to bread mixture; fold gently until thoroughly combined. Transfer to prepared dish, cover with foil and bake 30 minutes. Uncover and bake 15-30 minutes. Until top is browned and crisp. This stuffing was a hit. We will be adding this to our Thanksgiving dinners and even diners throughout the year. 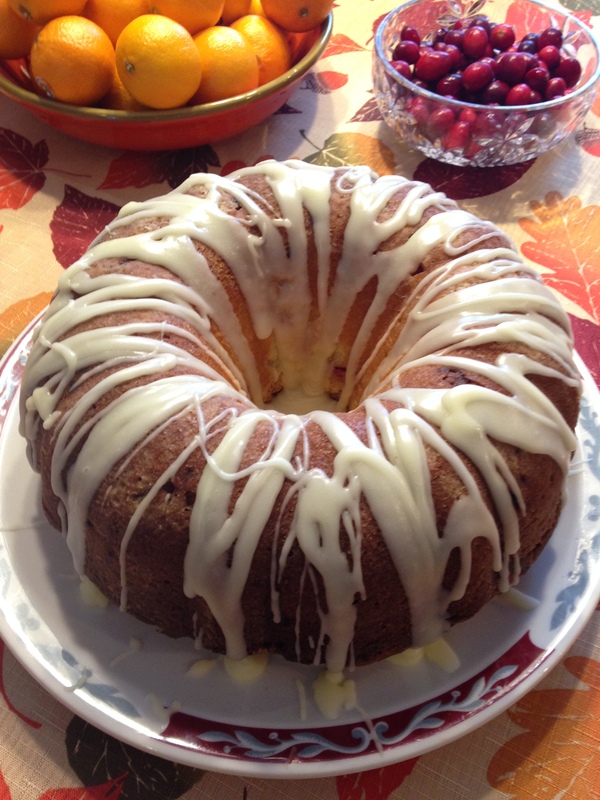 Now I have 2 dishes I will be making each Thanksgiving; Checkered Stuffing and Cranberry Orange Bundt Cake. During the holiday season Martin requests Russian Salad. Every Thanksgiving and Christmas he requests this salad on the table. Each year I get better and better at chopping pea sized potatoes, carrot and pickles. The smaller you chop, the better it is. Dice the potatoes and carrots to peas size. Put in sauce pan. Cover with water and parboil. Drain the potatoes and carrots. Put in large bowl. Place in refrigerator and serve after the salad sets for at least 2 hours. I generally make the night before. The chopping can take time. I find it a great stress reliever. Yeah, that sounds kind of crazy but it works for me. Don’t knock it until you try it. ALSO, I try to chop everything so when the potatoes and carrots are done parboiling I can put it all together. Enjoy this simple and delicious salad! Thanksgiving 2015. We enjoyed this so much last year I thought I would add to our menu this year. You should give it a try! Simple and Delicious!! 1. Preheat oven to 350. Spray 12 cup bundt pan with cooking spray and lightly flour. 3. Add vanilla and orange peel. Blend well. 5. In medium bowl, mix 3 cups flour, the baking powder and salt. Add to butter mixture alternately with sour cream, beating well after each addition. Gently stir in cranberries. Pour and spread batter into pan. 6. Bake 60-75 minutes or until toothpick in center comes out clean. (It took 75 minutes for this cake in my oven.) Let cool for 15 minutes and remove from pan. 7. For the glaze; In a small sauce pan over medium heat, combine powdered sugar, orange juice, butter and extract – whisk until smooth. Drizzle over bundt cake. ENJOY!! I found an article in Food Network magazine about grilled cheese sandwiches. It had 12 different recipes. I passed it around a couple of Fridays ago and had the kids pick out which one they would like for Sunday dinner. I made Minestrone Soup and grilled cheese sandwiches. It was a fun, relaxing Sunday. I had a blast making the different sandwiches. I ended up making a Parisian, Italian, Brie and Apricot and later in the week a Pastrami grilled cheese. Hero Roll sliced in half, 1 slice Provolone cheese, salami, prosciutto or soppresseta, hot cherry peppers, 1 slice provolone. Heat 1 Tablespoon of olive oil in a non stick skillet over medium low heat; add the sandwich and top with another skillet. Cook until golden brown and the cheese melts, about 3-4 minutes per side. Hope you give them a try. Enjoy!! Line a baking sheet with parchment paper. That will make cleanup much easier. Place bacon on your parchment lined baking sheet. All done. Enjoy your bacon!! Here is a simple and delicious dip. Martin requested it this weekend. Another Bulgarian treat. Cut eggplant in half lengthwise. Cut deeps slits in flesh. Bake in oven 400 degrees for up to an hour. When you can put knife through flesh easily, put under broiler for 3-5 minutes to brown flesh. Roast tomatoes at 400 degrees for 30 minutes. Put under broiler for 3-5 minutes to brown lightly. Roast peppers in oven or over stove. I roasted over burner on stove. You could also roast at 400 degrees for 30 minutes and put under broiler 3-5 minutes. When all veggies are roasted. Chop the tomatoes and roasted peppers. Take flesh out of eggplant and chop also. Mince the garlic cloves. Place all chopped vegetables in large bowl. Add oil, red wine vinegar, salt and pepper. Mix well. Place in refrigerator for a couple of hours. The longer you let it set, the better it will be. Serve with your favorite bread or crackers. Toasting the bread is a great way it too! Enjoy this flavorful Bulgarian dip. Let me know what you think! Ciao!! Rinse off chicken and pat dry with paper towels. Be sure the chicken is dry. This will give you a crispy skin. When dry, stuff cavity with rosemary and thyme sprigs. Generously salt the skin of the chicken. That is it. Perfect chicken every time. Told you it was easy. Next time I will post a picture for you. Just trust me on this one!! Martin requested Musaka this weekend. Bulgarian Musaka is a version of a popular dish of the Balkans, Eastern Mediterranean and the Middle East, Moussaka. The Bulgarian dish uses potatoes instead of eggplant. This is such a flavorful dish. Simple and very delicious! Put meat mixture in 9×13 baking dish and add the potatoes. Mix together so the spices are combined with the meat and potatoes. Add the water/broth. Put in 375 degree oven. Check every 15 minutes and mix together. It will take about 45 minutes for the potatoes to get done. While the meat and potatoes are cooking whisk together the eggs, yogurt and salt. When the dish is done, remove from oven, top with the egg mixture. Put back in oven and bake another 10 minutes. After the egg mixture is done, turn on the broiler. Broil until egg topping is browned, about 5 minutes. This is the first time I made this dish. Martin loved it. I always enjoy making a dish he would enjoy from his home country. I am sure in some sense it brings back memories of his grandparents and the meals they shared together. All I know is Musaka is a hit in our home! We will be making this simple and delicious dish more often! !